Fire is sacred in many spiritual traditions, and has been used in religious rites for thousands of years. Along with water, earth, air and space, fire is one of the five essential elements all living beings consist of. In the Vedic scriptures, Agni, or Fire, is the messenger between the people and their Gods and the personification of the sacrificial fire. The ritual of yajna, also known as yagya, havan, homa or Agnihotra, is one of the most ancient Vedic rituals. It consists of the kindling and consecration of a sacrificial fire, the invocation of one or more divinities, and the placing of offerings such as ghee, samagree (fragrant medicinal herbs) or grains into the flames. Sanskrit Mantras and prayers are recited during the ceremony, which is often performed during auspicious astrological moments. In modern Hinduism, fire ceremonies still play an integral part in daily worship, and are used as a symbolic form of communication with and honouring of the Divine. Everything offered into Agni, the sacred fire, is believed to reach the Gods. Vedic Fire Ceremonies are performed for all types of occasions: to let go of patterns and obstacles in our lives, to express gratitude, for healing, purification of the environment and ourselves, or to pray for success with a particular venture. The main reason for me, however, is to connect and communicate with the Divine and to express gratitude for this life and everything I have been gifted with. I have been performing Vedic Fire Ceremonies since 2008, and originally trained with Yogi Sanjay Kumar in the Arya Samaj tradition in Rishikesh, India. Since then, I have been studying with different teachers from different traditions, including Satyananda Yoga and Sachcha Dham, always adding more to my knowledge of this deep and powerful ritual. I regularly perform public Vedic Fire Ceremonies on special occasions such as religious festivals, Equinoxes, Solstices, Full Moons and New Moons. When I am in Rishikesh, India, I often perform the daily Arya Samaj fire ceremonies at Anand Prakash ashram at 8.00 am. I also teach an intensive in fire ceremonies at the ashram from time to time – please see my schedule or e-mail me for information on when the next one will take place. Personal tuition is also possible. In this fire ceremony, we work with Vedic mantras that help us to let go of the old, free ourselves from outworn karmic patterns and to invite a new, healing energy into our lives. In particular, we will work with our ancestral energies and the healing of long-standing issues and traumas that run through our family lines. We also honour our ancestors with a potluck feast after the ceremony. The workshop can be held in English as well as in German language. Download a PDF with more information here: Fire Ceremony workshop. Please see my schedule for planned workshops, or contact me to book one for your studio. 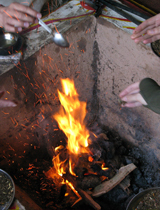 In this workshop, you will learn the principles of ancient Vedic Fire Ceremonies. You will be introduced to sacred mantras and yantras for self-healing, and learn how to prepare the sacred space and offerings. The workshop concludes with a communal fire ceremony for healing and transformation. The course can be held in English as well as in German language. Please contact me for further information, to request a personalized Fire Ceremony, or to be placed on the mailing list for upcoming events. Click here for an article I wrote about Vedic Fire Ceremonies for Yoga Magazine UK.